Those following the current economic debates would think that this has been said either by the current Finance Minister or someone in the bureaucracy at the ministry. However, this was actually said by Manmohan Singh in his Budget speech in 1992-93. Therefore, the government asking for higher dividends from RBI (and public sector firms) is not new. The government being the major shareholder in these organisations is within its rights to demand maximum/higher dividends. Let’s start from the beginning. At the time of inception, RBI started with a capital and reserve fund of Rs 5 crore each. It started as a shareholders’ bank. Thus, having a reserve fund was seen important for stability — just like in case of other banks. Moreover, RBI insisted that commercial banks should transfer a part of their profits so that reserves are equal to paid-up capital. 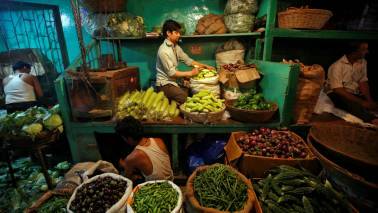 By equating the two at its end, RBI did set up an example for other banks to follow. 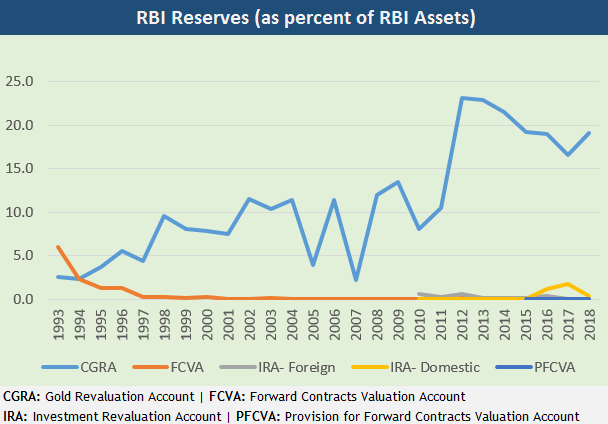 It is interesting to note that RBI’s capital has remained unchanged at Rs 5 crore, but its reserves have changed significantly over the years. RBI has also created new reserves for different purposes over time. For instance, the reserve fund today stands at Rs 6,500 crore and it has remained unchanged at least since 1999, shows the available annual reports on the RBI website. RBI should also put out historical annual reports, which will help people understand as to how the reserve fund grew with time. In 1955, the rural credit survey recommended that RBI should establish two funds: National Agricultural Credit (Long-term Operations) Fund and a National Agricultural Credit (Stabilization) Fund. The operations fund was intended to finance long-term lending to state governments and enable them to subscribe, directly or indirectly, to the share capital of all types of cooperative credit institutions. 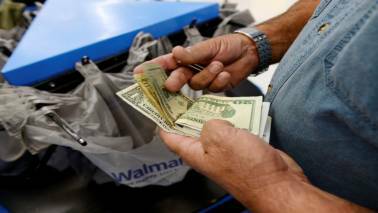 The stabilization fund was intended mainly as a source of medium-term finance for cooperatives and help them convert short-term loans, which had gone into default due to factors like a drought. Accordingly, both these funds were established in the same year and played a key role in the financing of the agriculture sector. Apart from an initial non-recurring contribution of Rs 5 crores, the bank was to contribute at least Rs 5 crores to the former fund and Rs 1 crore to the latter fund annually from its profits. In 1982, both these funds were transferred to National Bank for Agriculture and Rural Development (NABARD). The National Agricultural Credit (Long-term Operations) Fund was renamed to National Rural Credit (Long-Term Operations) Fund, signalling a broader application of funds. However, RBI continued to deploy a part of its profits towards the two reserves. The Act was modified and the central bank was mandated to “contribute each year such sums of money it may consider necessary and feasible to do so, to the National Rural Credit (Long Term Operations) Fund and the National Rural Credit (Stabilization) Fund maintained by the NABARD. Later, the reserve was developed to support the industrial sector. National Industrial Credit (Long Term Operations) Fund, which was established in 1964, along with the founding of the IDBI in the same year. RBI began to transfer money from its profits to the fund. This fund was utilized to finance the Industrial Development Bank of India’s (IDBI's) subscription to shares, bonds, and debentures of the Industrial Finance Corporation of India (IFCI), state financial corporations, and other financial institutions, notified by the central government such as Industrial Credit and Investment Corporation of India (ICICI). 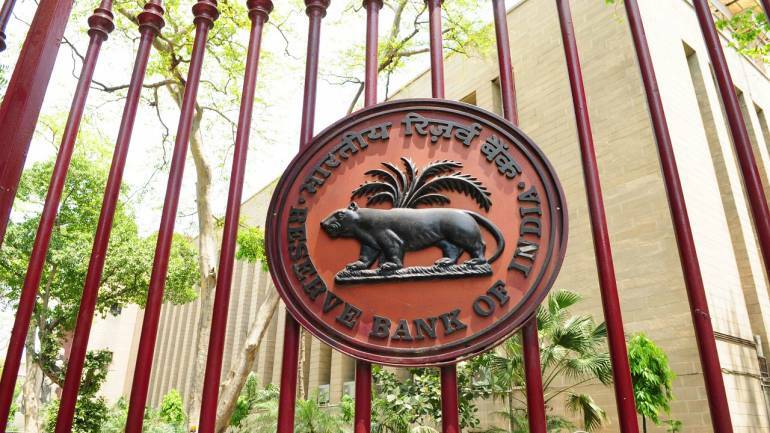 The next RBI’s reserve was the National Housing Credit (Long Term Operations) Fund, which was incorporated in the RBI Act (1934) under Section 46D 1934 in 1987. This fund was created to support the National Housing Bank (NHB). Its purpose was to provide loans and advances and purchasing bonds and debentures issued by the NHB. The above four funds/ reserves were created prior to the beginning of economic reforms in 1991. Before 1991, RBI played a critical role in the development and financing of financial institutions such as IDBI, NABARD, and NHB. But this started to change post-1991 when markets were expected to play a larger role in the financing of these institutions. However, as these funds were created under the RBI Act, the central bank had no choice but to transfer a part of its profit towards these funds. Accordingly, it was decided that a token amount of Rs 1 crore would be provided to the four funds from RBI's profits. This practice continues till date. After these legislated funds, let us turn to unlegislated reserves in RBI balance sheet. The first one here is the contingency reserve. The exact date of the formation of this reserve is not known. However, it was formed to absorb unexpected and unforeseen contingencies. Post-reforms, the unutilised balances in the industrial long-term fund, arising from repayments were also transferred to the contingency reserve. By 1997-98, Rs 400 crore was transferred from industrial fund to the contingency reserve. An internal RBI committee, headed by V Subrahmanyam, recommended that the RBI should pursue a pro-active policy of strengthening the contingency reserve and accordingly set an indicative target of 12 percent of the size of the bank's assets to be achieved in phases by the year 2005, subject to review if considered essential. Of the 12 percent, 5 percent were to be kept for losses from operations in government securities and foreign exchange markets, 5 percent for shocks to gold and foreign exchange rates and 2 percent for systemic risks and development activity. This also led to setting another targeted reserve in 1997-98, named Asset Development Reserve (ADR). It was set up to meet the internal capital expenditure and make investments in its subsidiaries associate institutions. The target for ADR was a percent of total assets by 2005. The chart below shows that contingency reserve never really touched the 12 percent target and after reaching 10.8 percent in 2010 has declined to 6.4 percent by 2018. 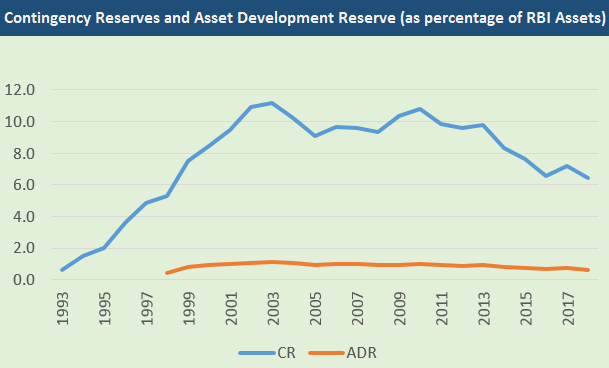 ADR reached 1.1 percent of assets in the 2002-04 period and hovered around 0.9 percent levels till 2013 before declining to 0.6 percent by 2018. Later, the Malegam Committee in 2013 said that the balances in the contingency reserve and ADR are in excess of the buffers needed and there was no need to make any further transfers. These two reserves were created to account for gains/losses on the valuation of foreign currency assets and gold. RBI is a conservative institution and books changes on these assets not towards its Profit & Loss statement but against these reserves. The first one here is the Exchange Fluctuation Reserve, which books gains/losses on valuation of foreign currency assets and gold. This was later renamed as Currency and Gold Revaluation Account (CGRA) in 2001-02. The second one is Exchange Equalisation Account, which is utilised to meet exchange losses on an accrual basis with respect of liabilities under schemes involving exchange guarantees provided by RBI. This was renamed as Foreign Exchange Forward Contracts Valuation Account (FCVA) in 2013-14. RBI also created a Provision for Forward Contracts Valuation Account (PFCVA) where contra entries to FCVA are booked. Two more reserves were opened to account gains/losses on foreign and domestic securities. 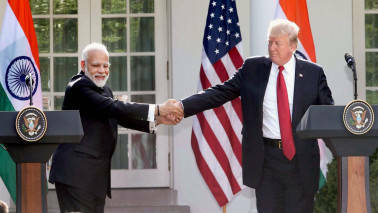 They were named as Investment Revaluation Account (IRA) – Foreign Securities, which was formed in 2009-10, and IRA-Rupee Securities formed in 2015-16. Within these five reserves, it is the share of CGRA which has risen steadily to touch 19 percent of RBI’s assets. The share peaked in 2011-12 at 23 percent. The other four reserves are insignificant. Amol Agrawal is faculty at Ahmedabad University. The views expressed here are his own.